The 2019 UNIST Commencement Ceremony was held in Gymnasium at midday on Tuesday, February 12, inviting families, friends, as well as the representatives of all degree recipients. At the ceremony, President Mooyoung Jung awarded 116 honorary Doctoral, 198 Master’s, and 1,043 Bachelor’s degrees. It turns out, since its opening in 2009, UNIST has a total of 4,519 graduates in science and technology, including 295 Doctoral, 864 Master’s, and 3,360 Bachelor’s students. At each convocation ceremony, UNIST recognizes the exceptional achievements of outstanding students through various awards, including the newly-established ‘Yebong Best Dissertation Award’. Established from the funds donated by the first UNIST President Moo Je Cho, the Yebong Best Dissertation Award is given to the author of the best doctoral dissertation. The aim is to recognize and encourage superior research and writing by doctoral candidates in any field of study. Dr. Dong-Bin Shin_the first recipient of Yebong Best Dissertation AwardDr. Dong-Bin Shin (Adviser: Professor Noejung Park) has been selected as the first recipient of Yebong Best Dissertation Award. Dr. Dong-Bin Shin (Adviser: Professor Noejung Park), the first recipient of Yebong Best Dissertation Award, has participated in about 21 SCI-level research papers, while he was pursuing doctoral studies in physics at UNIST. He has been involved in several studies on the identification of the electronic structure and properties of matter. Following graduation, he will serve as a postdoctoral researcher at the Max Planck Institute for the Structure and Dynamics of Matter (MPSD) in Germany. At the ceremony, JuHyun Kim in the School of Natural Science was awarded the ‘Minister of Science and ICT Award’. This award has been given to Mr. Kim in recognition of his outstanding academic achievements and for being an active participant in community service activities and mentoring for those underprivileged. JuHyun Kim received the Minister of Science and ICT Award by Assistant Minister Wonki MinJuHyun Kim received the Minister of Science and ICT Award by Assistant Minister Wonki Min In addition, NamWoo Kim (School of Nano-Bioscience and Chemical Engineering) and SeJun Kim (School of Business Administration) were named the 2019 valedictorian for Engineering and the School of Business, respectively. In recognition of such achievements, they were both awarded the UNIST President’s Award. The BNK Kyongnam Bank President’s Award went to SuMin Lee (School of Design and Human Engineering) and SangWoo Han (School of Business Administration) was awarded the LS Group Presidential Prize. Besides, the UNIST Best Research Award (UBRA) went to JaeGun Ryu (School of Energy and Chemical Engineering), SeungJin Lee (School of Materials Science and Engineering), and Dr. SungWoo Kwon (School of Urban and Environmental Engineering). 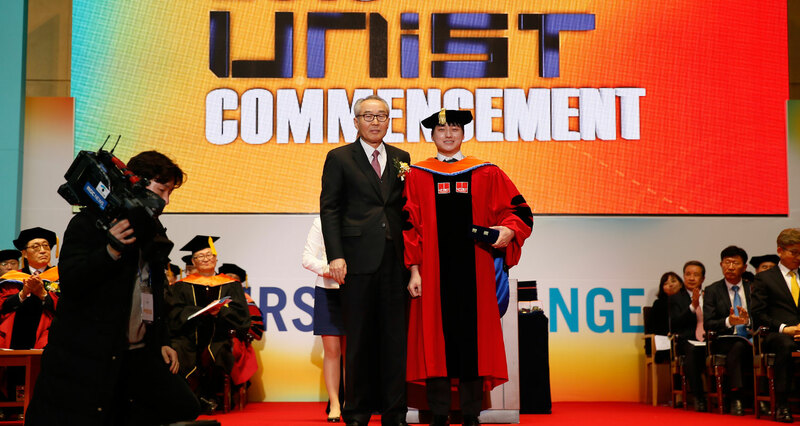 2019 UNIST commencement 1The graduating class of 2019 are wearing academic regalia at 2019 Commencement Ceremony, After the awarding of honorary degrees to distinguished individuals, President Jung shared his commencement message to the class of 2019. “You have been excellent representatives of all this university stands for and I am confident you will continue to serve as exemplary citizens who enrich the lives of those around them, like a ray of sunshine at the end of a dark tunnel,” says President Jung. 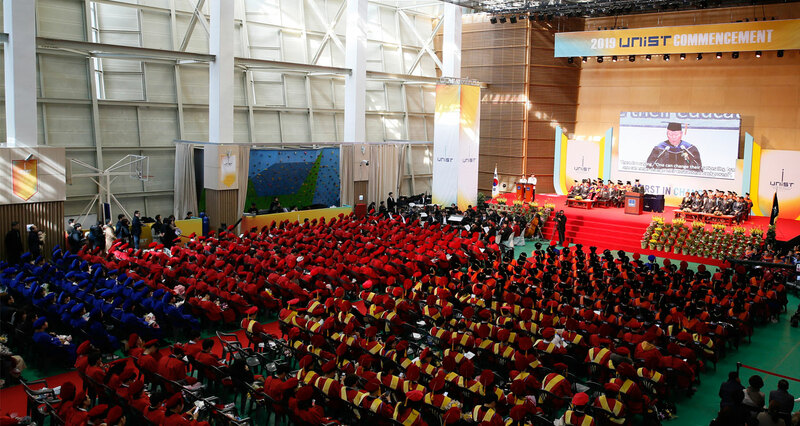 The ceremony featured the conferral of degrees, followed by the awarding of honorary degrees, greetings by University Officials and remarks by the distinguished guests, including the 2nd Vice Minister Wonki Min of Korean Ministry of Science and ICT (MSIT), the Deputy Mayor Byeong-gi Song of the Ministry of Economy of Ulsan City, the Council Chairman Si Cheol Yoon of Ulsan City Council, Mayor Seon-ho Lee of Ulju-gun, Chairman of Hyun-Soon Lee of the UNIST Board of Directors, and former UNIST President Moo Je Cho to celebrate this special moment of recognition.